We love this new product created by 4 talented students from Tiverton's Petroc College. 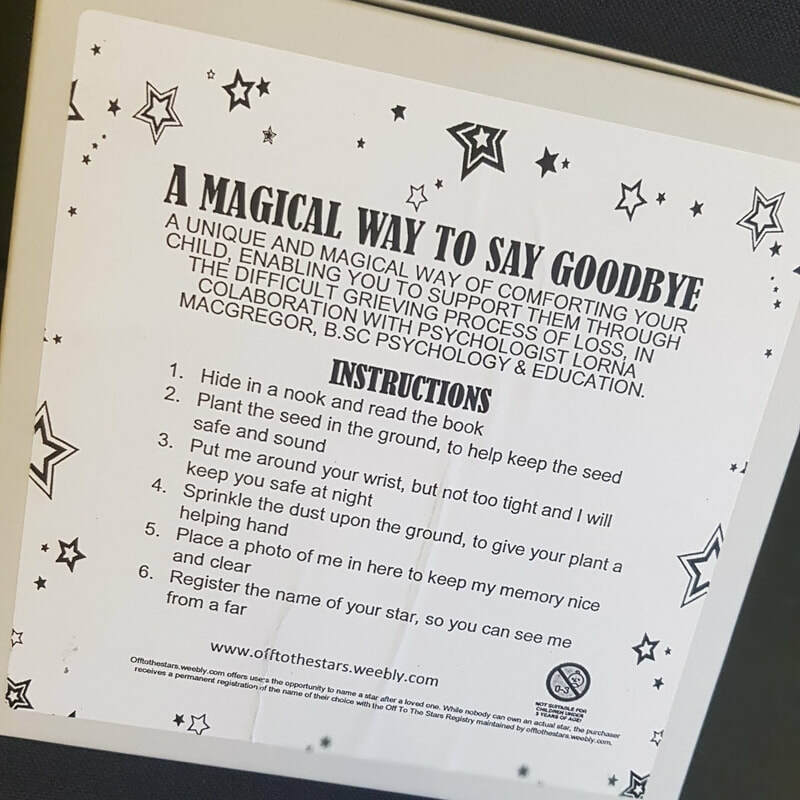 Off To The Stars is a unique & magical way of comforting a bereaved child, enabling parents to support them through grief and loss. The kits are priced at £11.99 and are available from our Gold Street office. Contact us for more information. ​We are so pleased to be the first funeral directors in the UK to have the recently-launched ‘GriefChat’ online bereavement support service available directly from our website. With access to real-time online chat provided by qualified, experienced bereavement counsellors, GriefChat is available free of charge from Monday to Friday, 9am to 9pm. It offers advice and support for grieving people, giving information about grief and how bereavement affects both individuals and families. The service will also be able to signpost users to other helpful bereavement care resources including online and in-print information as well as to local bereavement care services. Emotions after a bereavement can become overwhelming, especially at this time of year with the festive season fast-approaching. That’s why we’ve chosen to offer GriefChat; to give easy, on-demand access to reputable counsellors who can provide reassurance and understanding about grief and the impact of losing someone you love. Clicking either of the headings above will link directly to the relevant Gov.uk website pages for both payment schemes with an overview of each, an explanation of eligibility, what you might receive, and how to claim. We will also be pleased to speak to you personally if you're worried about paying for a funeral. Do feel free to get in touch. We are delighted that our application to become a member of the National Society of Allied & Independent Funeral Directors (SAIF) has been approved. More than just giving clients confirmation that we adhere to a professional Code of Practice, we hope this also gives reassurance that we have robust policies in place to deal with critically important areas of our work, including the way that we handle charity donations, cremated remains, jewellery, complaints, and the Health & Safety of our staff & visitors. Updated versions of these policies will be available in the footer of our website in the next few days. We think that ALL funeral directors should offer this level of transparency with regard to policies, procedures and prices. The Somerset Registration Service is pleased to announce that there is now an online booking service for appointments to register a death at any registration office in Somerset. The function is simple to use and gives you all the information you need before attending the appointment. You will receive a confirmation email detailing the appointment and what documents you need to bring, along with the address of the office you are attending. The Fair Funerals campaign is run by the anti-poverty charity Quaker Social Action (QSA), aiming to tackle the growing problem of funeral poverty, which has increased by 50% in the past five years. 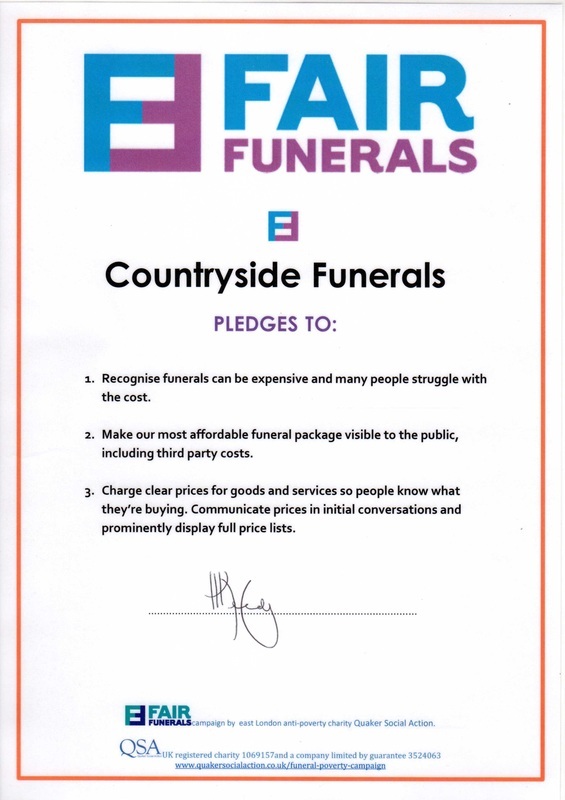 By signing the Fair Funerals pledge, Countryside Funerals hopes to help people on low incomes to arrange meaningful, affordable funerals. Talk about it now. Discussing your wishes in advance can provide clear plans and save unnecessary costs. Slow down, take a breath. Don't feel rushed into making funeral arrangements when someone dies. Take time to make the right decisions. Shop around. Costs vary hugely between funeral directors. Getting 2 or 3 itemised quotes could save you a lot of money. Ask about a 'simple funeral'. Ask for details of an affordable funeral package. Are you eligible for financial help? Call the DWP bereavement line on 0845 606 0265 or the Citizens Advice Bureau to see if you're eligible for financial support. It's your choice. There is no legal requirement to hire a funeral director, hold a ceremony, or pay for flowers, a coffin, or special vehicles. Cremation or Burial? It's a personal choice, but costs can vary widely between these options in different parts of the country. Make it meaningful. People will remember thought and goodwill rather than lavish expense. If no-one can pay? Ask about a simple, dignified funeral paid for by the hospital or council. When the person who has died has been seen by a doctor within 14 days prior to their death, this is the usual procedure for registering their death. If the death is referred to a Coroner , different procedures will often apply. We will help to liaise with the coroner's office and let you know what you will need to do in each individual case. We hope that the posts in our brand new blog will provide clear, straightforward advice and guidance on topics that are directly related to arranging funerals, and which often seem to prompt the most questions from families that we work with, as well as from the public at large. These subjects are included as blog-posts because this platform gives us the opportunity to elaborate, and to cover a little more detail than basic website pages, which tend to favour a more 'bullet-point' approach. There are lots of websites that do currently provide excellent information, and we will try to include links to some of these where appropriate. Please feel free to leave comments and feedback. I would be interested to read your responses, to answer any questions you may have or take on any suggestions for subjects that you may like to see covered in future. For advice, guidance, and practical support.